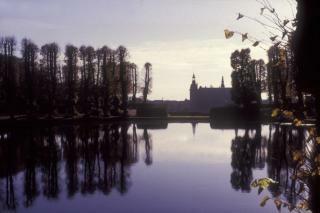 Frederiksborg Castle and park are unique, especially because of the surrounding landscape: A castle on three islets in one lake and a baroque garden on a slope facing east. The garden was designed by master builder and architect J.C. Krieger for King Frederik IV in 1720. It is a combination of terraces, steep grassy slopes, bosquets, embroidery-style parterres, ramps and several generations of lime-tree avenues that create form and perspective. And the icing on the cake is an intricate cascade system. Water from the high-level oval dam calmly ripples through the canals and falls over the cascade step on its way to the castle. King Christian IV had the castle built just as it looks today. Before that, in 1580, his father, King Frederik II, had built another castle after he had taken over Hillerødsholm Manor House from Herluf Trolle. One building and a bathroom are left from the time when the King and his hunting party enjoyed eating their venison and a refreshing bath here. The house with the prosaic function looks like a miniature castle and is now a picturesque feature for this scenic garden which was designed for King Frederik VII in 1850. The hunting and bathing lodge still stands and together with the monumental water axis in the castle grounds demonstrates the scope and importance of water.